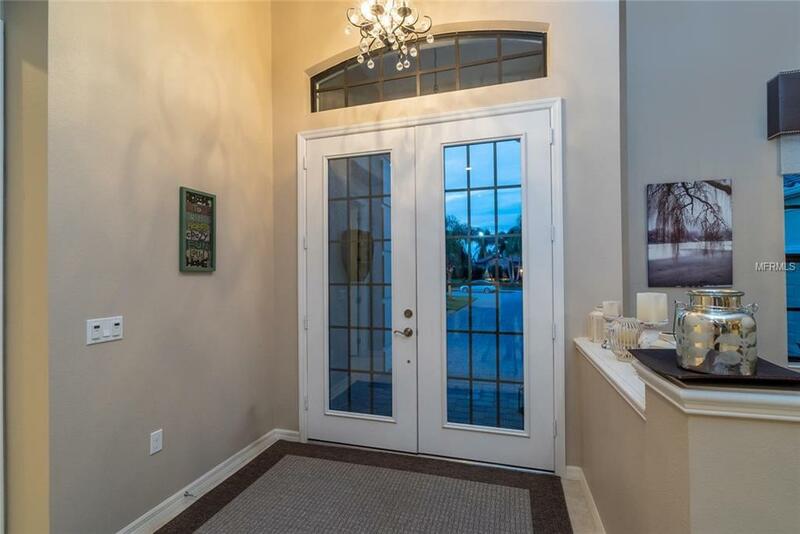 A magnificent opportunity awaits on nearly acre behind the gates of Country Club East in Lakewood Ranch. Imagine enjoying the Florida lifestyle in your expansive and peaceful backyard. Stately and serene describes this 4 bedroom, 4 bathroom residence that boasts an inviting floor plan and clean lines throughout. Arrive home to beautifully manicured landscaping with majestic palms framing your drive way. Entertain family and friends in the spacious dining room or more casually in the open kitchen and great room area. Cook for a small or large group in the gourmet kitchen with clean line cabinetry, modern Silestone surfaces, center island and breakfast bar seating. Open the sliding glass doors and relax on the screened pool terrace, take a dip in the saltwater pool, play in the spacious backyard or grill dinner in the outdoor kitchen. An amazing upstairs bonus room is the perfect place for extra lounging space, a game room or home movie theatre. The private master suite features two closets, walk-in shower, bidet, and separate vanities. A flex room upstairs is currently used as 5th bedroom, but could be used for second office as well. Residents of Country Club East enjoy a care free lifestyle with a resort pool area, fitness center and club house. Close to incredible shopping at UTC, golf, dining and the areas finest beaches. This meticulously maintained home has amazing curb appeal, serene backyard views and distinguished clean line interior selections. Welcome home!